Our reliable quotes for your roll off dumpster delivery make it easy to budget for your waste bin in Wasaga Beach. At Guaranteed Services, we can make any construction or landscaping project at your home or business in Wasaga Beach, Ontario more efficient with our roll off dumpster delivery services. There are several things you can expect from our roll off dumpster delivery services. To begin, we’ll make sure you’ve chosen the best size dumpster for your project needs and schedule delivery to your project site. Prior to roll off dumpster delivery, we’ll place protective boards on your driveway or landscape to ensure that your bin is secure and that your property doesn’t sustain any damage. 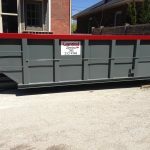 Once your project is complete, we’ll conveniently come to pick up your dumpster and dispose of the waste, making any project cleanup easy and efficient. Our reliable quotes for roll off dumpster delivery make it easy to budget for your waste bin, and you won’t find any hidden costs like administrative or environmental fees in your final bill. We’ll make sure that you are satisfied with our service and your bin delivery and pick-up in Wasaga Beach, Ontario. We have more than two decades of experience providing excellent services in the area, and we look forward to being your first choice any time you need to use a bin for a project. If you have questions about our bin rentals or need to schedule roll off dumpster delivery to your home or business in Wasaga Beach, reach out to us at Guaranteed Services today to learn more about how we can assist you. We look forward to helping you make your project a complete success. 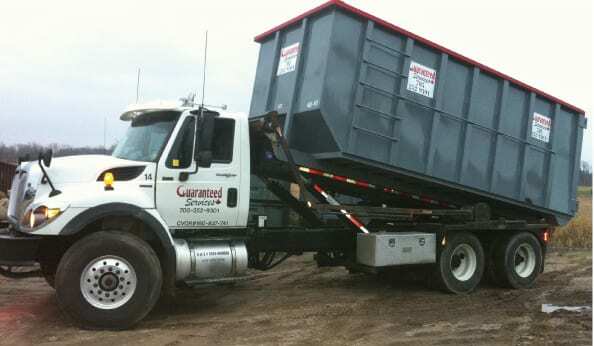 At Guaranteed Services, we offer roll off dumpster delivery services in Barrie, Innisfil, Collingwood, Orillia, Wasaga Beach, Angus, Stayner, and Midhurst, Ontario.